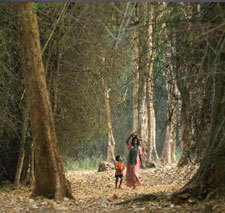 More than half of the total area of Pathanamthitta district is covered by forests. Kishkindha, the forest headquarters of the puranic hero of Ramayana, Sugriva, is believed to be located here. This hilly terra firma with unsurpassed beauty is acknowledged as the headquarters of pilgrim worship in Kerala. Sabarimala, a hill shrine attracts more devotees from all around the globe than the total number of devotees put together that throng the rest of the temples in Kerala. Pamba, on the banks of which this temple is built by Parasurama, the legendary sage, is considered to be holier to Hindus. Lord Ayyappa or Dharmasastha, a son born to Lord Siva from Mohini, Lord Vishnu’s seducing incarnation as a damsel, is worshipped here. This district is frequented by Indian and foreign tourists because of its water fiestas, religious shrines and cultural heritage. This is a district where agricultural commodities like rubber, pepper and cardamom are harvested in large quantities. Situated at the lap of Western Ghats, Pathanamthitta’s southern boundary is Kollam, western is Alappuzha and northern is Idukki. The important rivers that flow through Pathanamthitta district are Pamba, Achenkovil and Manimala. The name Pathanamthitta is derived from two words Pathanam and Thitta which mean an array of houses on the river side. Pathanamthitta is a land of scenic beauty, fairs and festivals. Air: Nearest airport is Trivandrum International Airport (119 km), Ph: 2501220. Rail: Nearest railway stations are Chengannur (28 km) and Thiruvalla (30 km). Road: Pathanamthitta is connected by road with several tourist centres and cities. Long distance buses operate from KSRTC Bus Station, Ph: 0468 2222366, 2229213. Sabarimala: (Nearest railway station is Thiruvalla 102 km, 65 km from Pathanamthitta, 180 km from Thiruvanananthapuram and 210 km from Kochi) One of the most famous pilgrim centres in India, Sabarimala is situated on the mountain ranges of the Western Ghats at an altitude of 914 meters above sea level and is accessible only by foot from Pamba (4 km). The temple is dedicated to Sree Ayyappa. Mandalapooja and Makaravilakku are the two main events of the pilgrim season. The temple stays closed during the rest of the year except for the first five days of every Malayalam month and during Vishu. People of all casts and creeds are permitted into the temple. However, entry in not allowed to women between 10 and 50 years old. Kodumon Chilanthiyambalam: (15 km from Pathanamthitta Town) This is a temple situated at Kodumon a tiny town in Pathanamthitta. Chilanthiyambalam is a temple dedicated to the God of Spider. The main deity is Mahalakshmi and it was built during the time of Sakthibadra Kingdom. The water from the precincts of this temple is believed to cure all skin related diseases. Kodumom is the birth place of Sri Sakthi Bhadrah the doyen of Sanskrit dramas like Aascharyachoodamani which was composed in original and pure Sanskrit. Thiruvalla: Thiruvalla is the headquarters of Syro Malankara and Marthomite Churches. The Paliakara Church here is famous for its wonderful mural paintings. The Sree Vallabha temple at Thiruvalla is the only temple where Kathakali is performed as a daily ritual. Mannadi: (13 km from Adoor and 50 km from Thiruvalla) Mannadi is famous as a historical town. This is where Veluthampi Dalawa, the renowned freedom fighter of Travancore, spent his last days. The ancient Devi Temple here has some beautiful stone sculptures. The annual festival is held during February/March. The Kerala Institute of Folklores and Folk Arts functions here. Niranam: (7 km from Thiruvalla) Niranam is a small town and internationally reputed for having the oldest church in India built by none other than the apostle St. Thomas in the year AD 52. Niranam is also the birth place of Kannassa Kavikal, the famous poets and social reformers. Nilakkal: (5 km from Plappally) Nilakkal is famous for its Mahadeva temple, on the way to Sabarimala. Most of the pilgrims to Sabarimala halt here for a sojourn and worship. The estate of the Farming Corporation and Ecumenical Center of the Christians are located here. Cherukolpuzha: An important religious convention of the Hindus is held at Cherukolpuzha on the river bed of Pamba, during February every year. Pandalam: (14 km from Chengannur railway station) It is believed that Lord Ayyappa of Sabarimala spent his human life in the palace of Pandalam as son of the king. Therefore this town is considered as a holy place. The Valiyakoikal temple on the bank of River Achankovil has been modeled as a replica of Sabarimala Shrine. Pilgrims usually stop here for worship before proceeding to Sabarimala. Three days prior to the Makaravilaku festival, the sacred ornaments of Sree Ayyappa are taken in a procession from Pandalam to Sabarimala. Parumala: (10 km from Thiruvalla) The mortal remains of Mar Gregories Metropolitan, the declared Saint of Malankara Orthodox Church kept here. The commemoration day of Mar Gregories Metropolitan is celebrated on the 1st and 2nd of November. Charalkkunnu: The picturesque hill station offers a panoramic view of the surrounding valleys. A camp house nearly provides comfortable lodging. Omallur: (5 km from Pathanamthitta) People from within and outside the state participate in the annual cattle fair, Vayalvanibham, held during the Malayalam month of Meenam every year. The Rakthakanta Swamy temple is an attractive pilgrim centre of Omallur. Malayalapuzha: (8 km from Pathanamthitta) The Bhagavathi temple where the Benefactress Goddess is consecrated is very renowned. The temple is also known for its beautiful wall paintings and artistic stone carvings. The Rock-cut Cave Temple: (5 km from Pathanamthitta) This famous Rock-cut Cave Siva Temple is a great archeological wonder and dated back to 8 century AD. The Rock-cut Cave Temple with great significance bears close resemblance to the pallava style of architecture. The stone carvings and engravings are among the earliest specimens of stone sculpture in Kerala. Aranmula:Aranmula is famous for a unique handicraft item, Aranmula Kannadi a special mirror designed only here and exported to various nations of the world. The famous Parthasarathi temple, dedicated to Sree Krishna on banks of Holy River Pamba is situated here. The 18th century murals attract large crowds from all over the world. Aranmula snake boat race is conducted on the last day of Onam festival in connection with the annual commemoration of the installation of the diety. The snake boats assemble near Sree Parthasarathy temple before the grand procession. Each boat is 100 feet long and bears 4 helmsmen, 100 oarsmen and 25 singers. Vijnana Kalavedi at Aranmula is an institute that imparts training in classical arts like Kathakali, classical music and Kalaripayattu. Kadamanitta: (8 km from Pathanamthitta) The Devi temple here is very popular. During the 10 day long festival in every year, padayani, an ancient performing art is enacted daily. Maramon: Maramon attracts one of the largest crowds of religious get togethers in the world. Situated near Kozhencherry, Maramon is the venue of the Maramon Religious Convention. The convention is attended by people of all communities. It may be the largest Christian convention of Asia. Usually held in February this convention is addressed by philosophers, religious thinkers and Christian scholars from across the world. Konni: (11 km from Pathanamthitta) Konni is beautiful of agricultural plantations like rubber, pepper, ginger and coffee. There is a training centre for elephants at Konni. Konni is also known for its elephant rides and the Aanakoodu where elephants are trained for work. Perumthenaruvi: (36 km from Pathanamthitta) This waterfalls on the banks of the Pamba River is a favourite picnic spot on the way to Vechuchira. Kaviyoor: Kaviyoor is renowned for its temples. Kaviyoor Mahadeva temple which was constructed in the 10th century is considered as one of the oldest Mahadeva temples in Kerala. The Hanuman temple on a small hillock is the best examples of gable style of architecture. Thekkudi Cave temple which is constructed in Pallava architectural style in 8th century is very beautiful. Mulloor Smarakam: (12 km from Pathanamthitta) This memorial is rendered as the respectful memoir of the late social reformer and poet Sri Mulloor Padmanabha Pillai at Elavumthitta. Kakki Reservoir: Exhilarating boating experience is offered in the artificial lake here. The wild life of surrounded forest also gives magical moments in the lake. Maniyar: (20 km from Pathanamthitta) Maniyar is a beautiful dam site. The leisure can be enjoyed comfortably here with panoramic view of nature. Manjanikkara Church: The mortal remains of Mar Ignatius Elias III, the holy patriot of Antioch are kept in this church. He died at this place in 1932 while his visit to India. Now this is an important pilgrim centre and in February the annual festival is held. Vijnana Kalavedi Cutural Centre:Under Indo-French cultural exchange programme, this institute was established by a French woman Louba Schild in 1977. In order to preserve the arts and cultural heritage of Kerala, the institute attracts people from all over the world. Vastu Vidya Gurukulam:The institute is the result of preserving ancient traditional arts of building and construction and it was established in 1993 on the banks of Pamba River. St. John’s Cathedral, Thiruvalla:This new Cathedral at Thiruvalla looks like a temple and can accommodate 2000 people and has no pews.